Sentinel is an oral broad-spectrum anthelmintic and flea control product for dogs. It is for the prevention and control of flea populations, the prevention of heartworm disease and the treatment and control of roundworms, hookworms and whipworms in dogs. 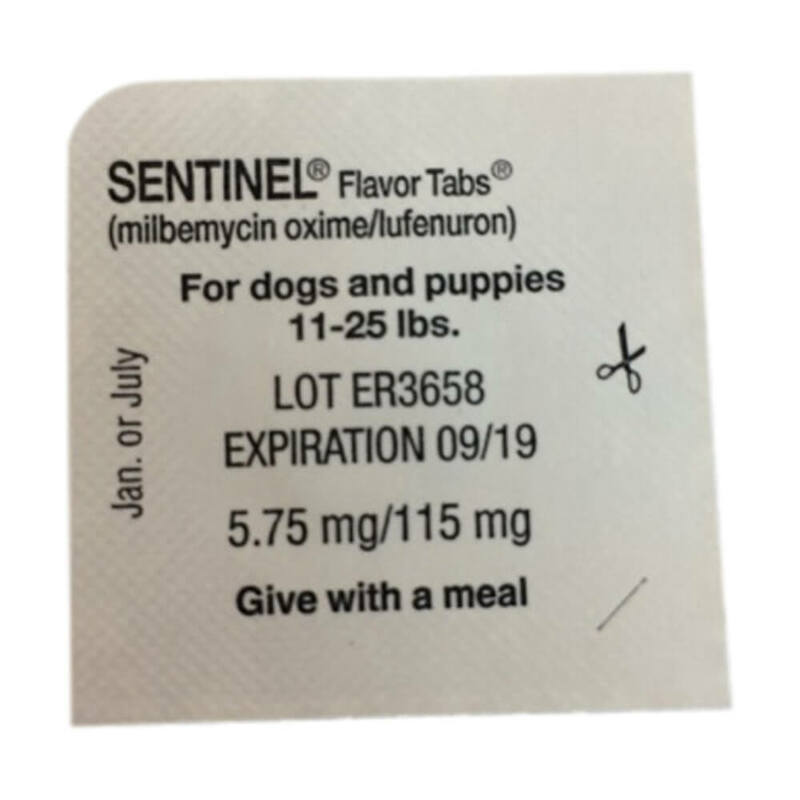 SENTINEL® Flavor Tabs® are given orally once a month at the recommended minimum dosage of 0.23 mg/lb (0.5 mg/kg) milbemycin oxime and 4.55 mg/lb (10 mg/kg) lufenuron. * Please see separate insert in this package for concurrent dosing of SENTINEL® Flavor Tabs® and CAPSTAR® tablets. 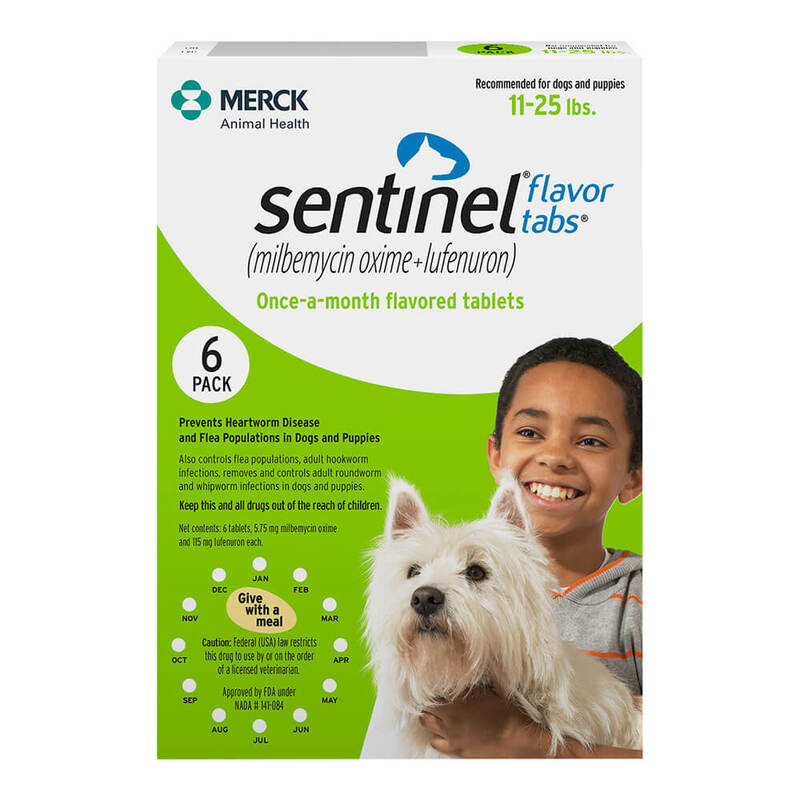 TO ENSURE ADEQUATE ABSORPTION ALWAYS ADMINISTER SENTINEL Flavor Tabs TO DOGS IMMEDIATELY AFTER OR IN CONJUNCTION WITH A NORMAL MEAL. 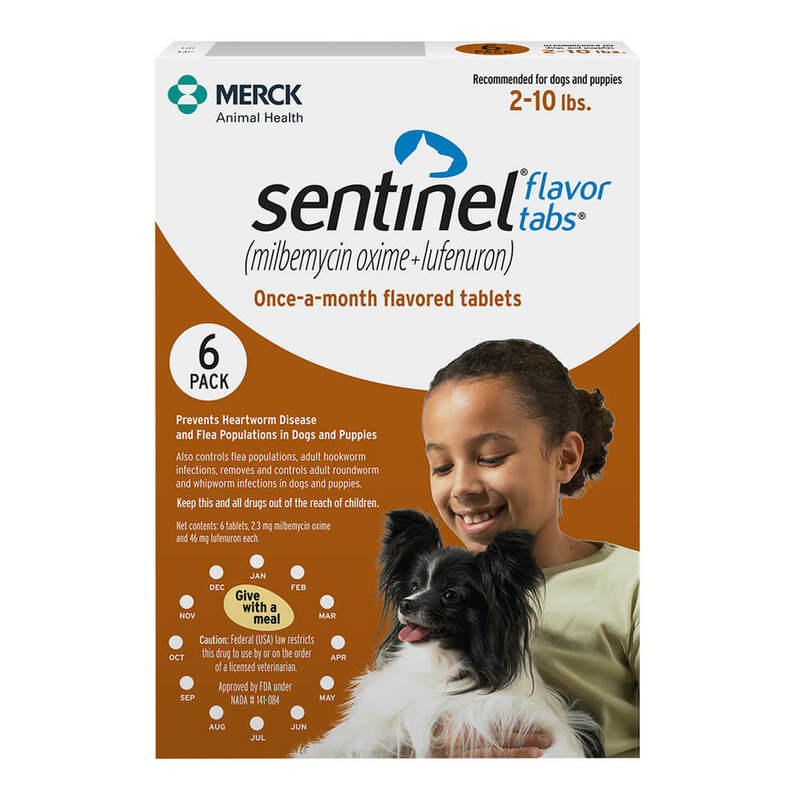 SENTINEL® Flavor Tabs® are palatable and most dogs will consume the tablet when offered by the owner. As an alternative to direct dosing the tablets can be hidden in food. Be certain the dog consumes the entire tablet or tablets. Administer SENTINEL® Flavor Tabs® to dogs immediately after or in conjunction with a normal meal. Food is essential for adequate absorption of lufenuron. Watch the dog closely following administration to be sure the entire dose has been consumed. If it is not entirely consumed redose with the full recommended dose as soon as possible. SENTINEL® Flavor Tabs® must be administered monthly preferably on the same date each month. Treatment with SENTINEL® Flavor Tabs® may begin at any time of year. In geographic areas where mosquitoes and fleas are seasonal the treatment schedule should begin one month prior to the expected onset and should continue until the end of "mosquito and flea season." In areas with year-round infestations treatment should continue through the entire year without interruption. If a dose is missed and a 30-day interval between dosing is exceeded administer SENTINEL® Flavor Tabs® immediately and resume the monthly dosing schedule. If SENTINEL® Flavor Tabs® replace daily diethylcarbamazine (DEC) for heartworm prevention the first dose must be given within 30 days after the last dose of DEC. The palatable once-a-month prescription tablet that prevents heartworm disease and flea populations in dogs and puppies. SENTINEL® Flavor Tabs® also control flea populations and adult hookworms and remove and control adult roundworm and whipworm infections in dogs and puppies. Do not use in puppies less than four weeks of age and less than two pounds of body weight. 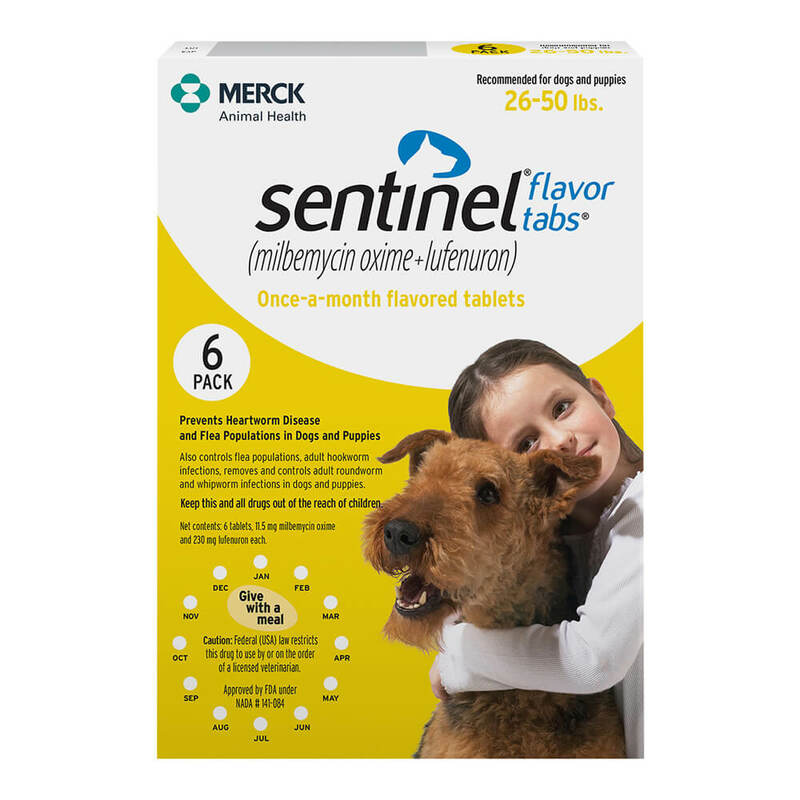 Prior to administration of SENTINEL® Flavor Tabs® dogs should be tested for existing heartworm infections. 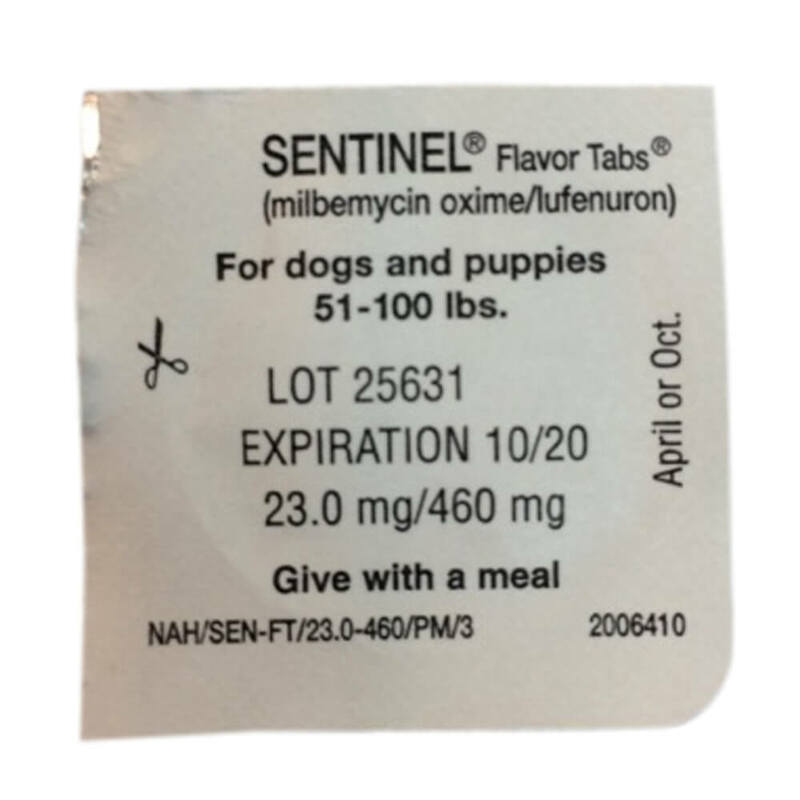 Infected dogs should be treated to remove adult heartworms and microfilariae prior to initiating treatment with SENTINEL® Flavor Tabs®. Mild transient hypersensitivity reactions manifested as labored respiration vomiting salivation and lethargy have been noted in some treated dogs carrying a high number of circulating microfilariae. These reactions are presumably caused by release of protein from dead or dying microfilariae. 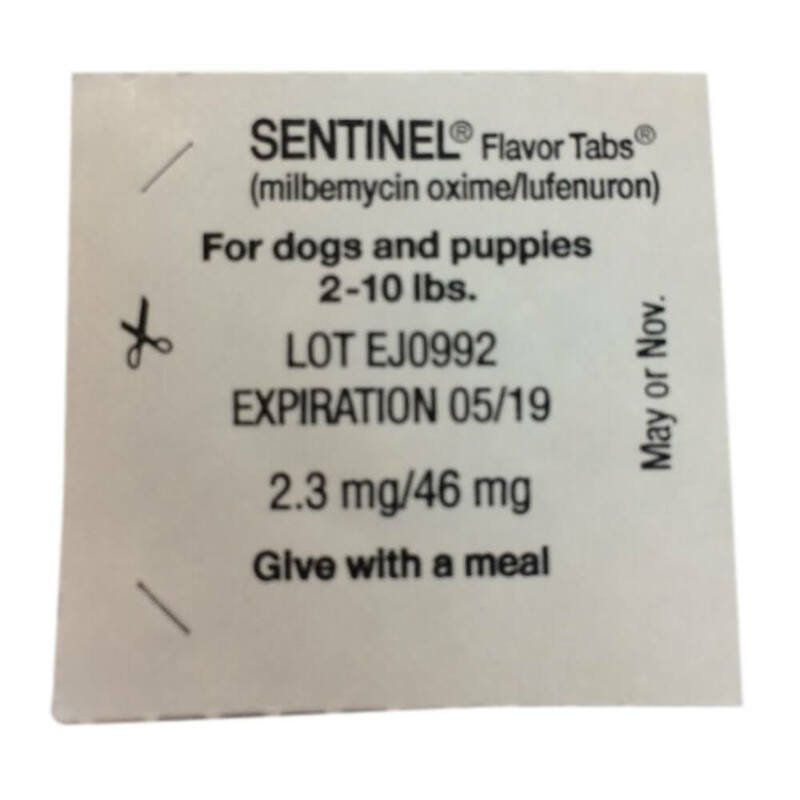 This insert describes the concurrent use of SENTINEL® (milbemycin oxime/lufenuron) Flavor Tabs® and CAPSTAR® (nitenpyram) tablets for the management of fleas on dogs and puppies. Please read the insert contained in each package for complete information on the individual products prior to dispensing or dosing. The effects of SENTINEL® Flavor Tabs® on heartworm disease and internal parasites are not described in this supplement. In dogs and puppies the concurrent use of SENTINEL® Flavor Tabs® and CAPSTAR® tablets is indicated to kill adult fleas and prevent eggs from hatching. The effects of SENTINEL® Flavor Tabs® which prevent and control flea populations and CAPSTAR® tablets which treat flea infestations are combined to provide a FLEA MANAGEMENT SYSTEM. Give SENTINEL Flavor Tabs once per month to prevent and control flea populations. 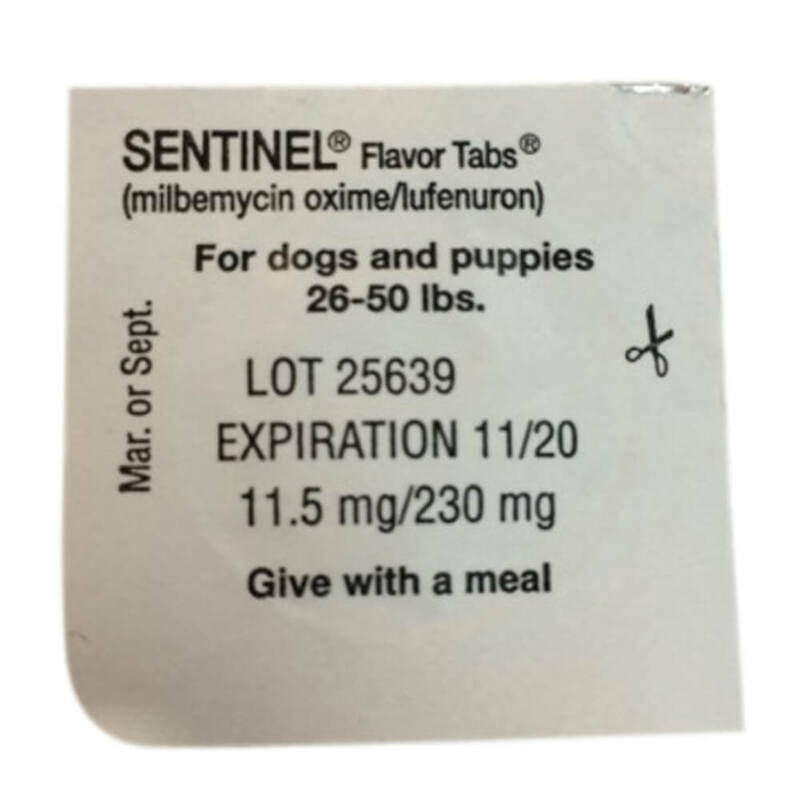 SENTINEL® Flavor Tabs® contain lufenuron. Lufenuron controls flea populations by preventing the development of flea eggs and does not kill adult fleas. If a dog currently has a flea infestation more rapid relief can be accomplished by adding CAPSTAR® to the treatment as follows. If your pet currently has a flea infestation use CAPSTAR® tablets to kill adult fleas. CAPSTAR® tablets contain nitenpyram and are effective for the treatment of flea infestations. Nitenpyram starts killing adult fleas within 30 minutes of administration. Administer CAPSTAR® tablets once per week until adult fleas are no longer observed. For a severe flea infestation administer CAPSTAR® tablets twice per week until adult fleas are no longer observed. Additional CAPSTAR® tablets may be administered as needed to kill the occasional adult flea picked up from infested environments. It is important to treat all cats and dogs in the household. All cats should be treated with approved products like lufenuron in combination with nitenpyram as needed. Fleas can reproduce on untreated pets and allow infestations to persist. The combination of SENTINEL® Flavor Tabs® and CAPSTAR® tablets should be administered according to the following schedule. Weigh your dog prior to administration to ensure proper dosage. Do not administer to dogs under 2 pounds. **:Dogs over 100 lbs. are provided the appropriate combination of SENTINEL Flavor Tabs. The safety of the concurrent use of SENTINEL® Flavor Tabs® and CAPSTAR® tablets in pregnant or nursing dogs or in puppies less than 11 weeks of age has not been demonstrated. 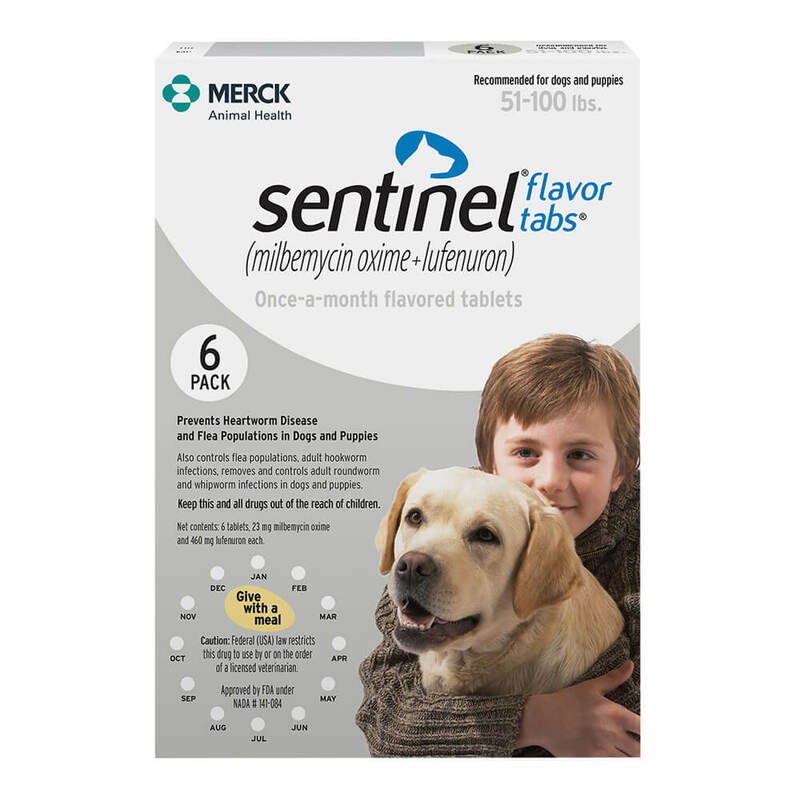 The following adverse reactions have been reported in dogs after giving SENTINEL® Flavor Tabs®: vomiting depression/lethargy pruritus urticaria diarrhea anorexia skin congestion ataxia convulsions hypersalivation and weakness. Please refer to the labeling for SENTINEL® Flavor Tabs® and CAPSTAR® tablets for information about the effectiveness of each product. Studies testing the concurrent use of the two products demonstrated that each product remains effective for its labeled indication when both are administered concurrently. In a simulated home environment the administration of SENTINEL® Flavor Tabs® monthly and CAPSTAR® either once or twice weekly demonstrated a greater and more rapid reduction of established flea infestations than SENTINEL® Flavor Tabs® alone. The combination of nitenpyram milbemycin oxime and lufenuron has been tested in a 90 day laboratory study. Administration of 5X the recommended use rate of CAPSTAR® tablets for 90 consecutive days concurrently with administration of 5X the recommended use rate of SENTINEL® Flavor Tabs® every 2 weeks for 7 treatments was well tolerated. In addition to the common nuisance irritations associated with infestations fleas can be responsible for skin conditions in the dog such as flea allergy dermatitis. Fleas also transmit other parasites including tapeworms. The control of flea infestations reduces the problems associated with these parasites. Store SENTINEL® Flavor Tabs® and CAPSTAR® tablets as described on the individual product inserts.